Greetings! 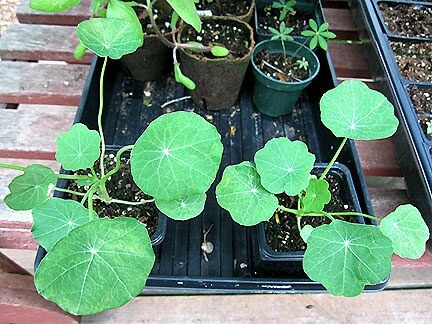 This is my third post for the Seed GROW Project, organized by Mr. Brown Thumb, with nasturtium seeds (Tropaeolum majus 'Spitfire') donated by Renee's Garden. Well, I'm sorry to report that the two nasturtiums above are all I have left. I winter-sowed six in a flat and five in a milk jug. The one on the left is the only one that came up in the milk jug and the one on the right is the only one that survived in the flat. Michigan has fickle weather. It warmed up early this year — everything is about a month ahead of schedule. But then it still got freezing at night and even though I covered the flats, all but one nasty succumbed to frost, turning kind of gooey. 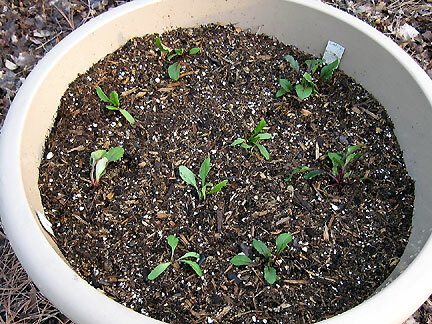 A few other seedlings were affected in a similar way. 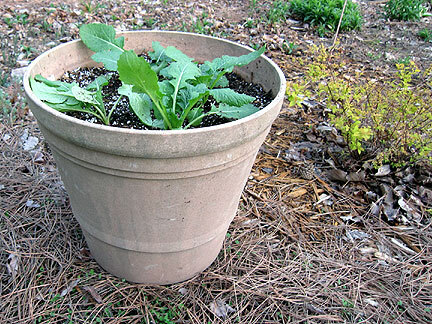 Breaking News: May 3, Ann Arbor: A second nasty in the milk jug has sprouted! I've sown tons of nasturtiums (particularly for the Cobblestone Farm historic fountain garden) and never had a problem. I'm certain it had nothing to do with the seed quality, but with environmental conditions. I normally would have winter-sown them by February, and I did these in early March. If the seed coat needed softening for the seeds to sprout, perhaps there wasn't a long enough moist period in the flats. And frost sometimes kills even protected plants. I'm going to be planting the nasties along my privacy screen, along with the hops and some morning glories (which also had low germination, also very unusual). I still have a lot of nasty seeds left over and will spring sow them soon, as I do love the plants. Well, since I'm still here and you're still here, let's look at some other winter-sown plants. Most everyone has their set of true leaves and could be planted out... but I like the tomatoes to get a lot bigger first, and I need to figure out where all the rest can go. Corn (circled in orange to the right) wants you to know it can be winter-sown! Two kind of beets here, Detroit Dark Red and Chioggia (thanks, LaManda! Shout-outs for other seeds are in the previous post.). 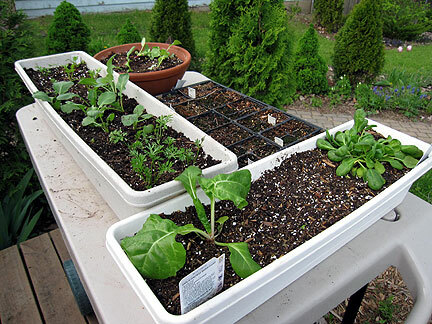 I grow them in containers because I have limited beds with full sun exposure and can tuck the containers into sunny spots throughout the garden. I also planted out two kinds of peas, beans, stock, and baby blue eyes 'Pennie Black' in this tiny patch of lawn that gets pretty good sun. The beauty berry was the only thing previously there. I did a run (um, slow walk) around the garden, gathering any and all kinds of supports I could find and felt pretty resourceful. Later it dawned on me it might look a little hillbilly, but I don't think we're ready for an #uglygardens redux, are we?! Because I still seem to be posting and you still seem to be reading, let me meander further. Remember earlier this year I made my first plastic model, a DC-3 aeroplane, under the tutelage of my friend, Peter? 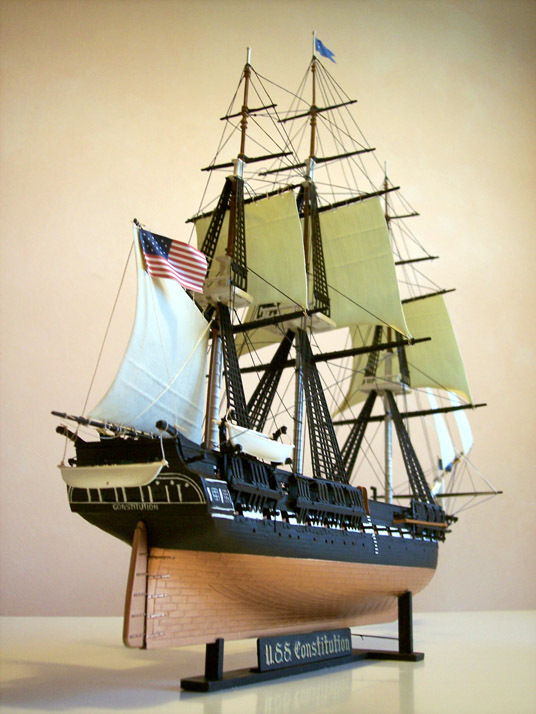 He recently completed this stunning plastic model of the USS Constitution. The deck has all sorts of wonderful colors and details and the whole things just blows me away (you can click to enlarge). And check out the flags! He made them curl like that; that wasn't part of the kit. As one of his friends remarked, he da man! Finally, because the photo of Fiona (aka Bizi) in the last post looked a little, um, Sopranos, here is a contrasting shot where she looks like a sweet fuzzy widdle baby kitten. (Trust me, this is rare. 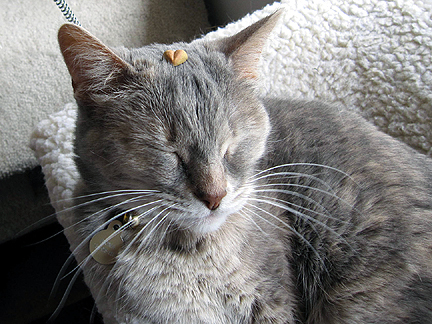 She even let me put the cat snack on her forehead!) Noogie! *It's not just Mish-Mash Monday (I'm tickled to see how many of you have adopted the term)! If you'd like to borrow titles for willy-nilly posts for other days, go here. I always grow nasturtium from seed. I would not say I have a great success rate but at least I do manage to get some of these lovely plants for the garden. I used to grow veggies when I first moved here. With the rabbit problem increasing I have given up. Cute to see your kitty pose so nicely. If she is anything like mine it is a complete staged event - my pair are serial kitties to be sure. Not exactly the cuddly type. I had 8 of 9 wintersown nasties germinate even though I didn't plant them until mid-March. Success is all kind of random with plants, isn't it? Luckily there are always more seeds! Your kitty is so fuzzy and adorable. Nothing is better than putting things on pets' heads. Fiona is doing just what everyone down here in rain soaked Tuckassee should be doing. Curled up dozing! That boat is awesome! Oh je, warst Du fleissig Monica! So viel ausgesät. Dafür habe ich leider nie die Zeit, weil ich ja Vollzeit berufstätig bin. Das Foto von Fiona ist einfach zuckersüß. Genau wie das Candy auf ihrem hübschen Kopf ;-). All of your seedlings that came up are looking good! One of my cats is almost literally 2-faced; she's a serious hunter and a snuggle buggit. Her brother makes a living just looking good. Hi Monica, I loved your post today, and yes, I did read it all. LOL I took photos today for Mish Mash Monday, and I'm hoping to be able to stay awake enough to put some of them in a post. I keep thinking I'm going to try winter sowing, but haven't so far. I have scattered seeds in the fall right in the ground. To save money, I planted some flower seeds in my wash tubs this spring. My problem, is that the squirrels keep digging holes, and pulling up some of the plants. I do have some nasturtiums that look like they will make it. I may end up needing to buy plants to add to the containers. I have all kinds of this and that in our back yard to keep Heidi from digging. Oh, and I love the photo of your cat! It's interesting to see the variety that you've planted, Monica - like the name Spitfire! I don't remember ever hearing the term winter-sow when I lived in Illinois (before 1999) so guess it's a fairly new concept? We plant seeds all winter here where the ground doesn't freeze, but cold snaps can still take them out so we have to replant, too. The verification word is "multini" - now picturing a giant martini glass with a crowd around it, sipping from long straws. 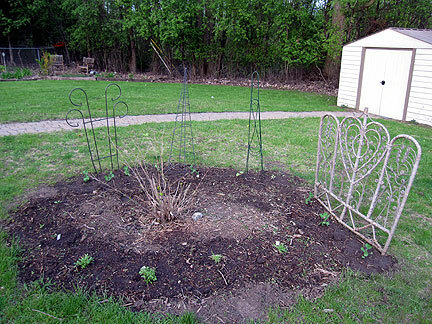 Your seedlings look great Monica, and I love your mish-mash of supports in your sunny beautyberry bed. As the plant climb them, it's going to look really neat! Fiona looks very sweet in her snuggly spot there! Thanks for the link to the "mish-mash" titles for other days so I won't forget; this has been a great idea, Monica, no matter what day we decide to wander around a bit. I'm impressed by your winter sowing, Monica, even if only two of the original nasties survived. All I had to show for my first attempt was a sunflower. I think I had more originally, but once I opened up the milk jugs, I was bad about making sure they were closed again on cold nights, so it's no wonder most didn't survive. I didn't even attempt to winter sow nasturtiums; they do so well just thrown in the garden, so I'll be doing that again soon. But your tomato plants--wow! I've been babying mine for weeks indoors. Hi Monica, I did a little winter sewing and had no luck. We had really strange weather as you said. A few weeks of hot weather in early March followed by overnight freezes in April. Nothing sprouted from my winter sewn group. I did start some seeds indoors in pellets. They gave me almost 100% germination but I had to carry them inside at night and back outside a lot over the last month. My little sweet peas are already set out to grow and 24 foxgloves, a dozen blue flax, six Northern Lights chard and a couple dozen poppies are waiting to go out. Nasties, a ship, and a kitty. Awesome! It's great meeting other GROW project writers. Look forward to your next update! I like nasties too and grow them at the allotment where they conveniently self seed. 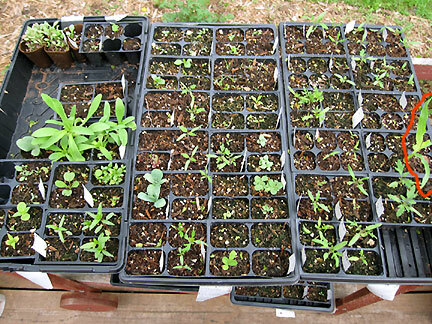 What an impressive range of seedlings Monica. Love the photo of Fiona - she looks most chic.